Something Is Out There...: A Deeper Look At The Fairview Schools As They Are Today. A Deeper Look At The Fairview Schools As They Are Today. 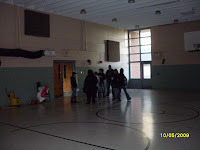 When we arrived at Fairview, we entered the newer building and went into the gym. I would think it looks the same. I didn't go to school at Fairview so I don't know. But our first exploration of the school started in this room full of echoes. We listened to Mindy tell us of her experiences as well as Ricky and Nick. Nick's son, Nick and his friend, Travis, showed up shortly after this. Some rooms are shocking, at least for me. 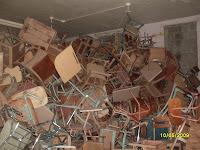 The last thing I ever expected to see was a huge pile of desks that kids once sat in. It was somewhat disturbing to me. Not to mention I saw something like this in a movie somewhere but I just can't put my finger on which one. It was eerie that all were left here. Now you know what happened to your desk in grade school. Creepy. Just Creepy. But it made the room that much more interesting to go in and explore. 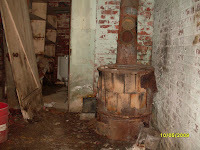 Another thing that took me by surprise was this old stove. Hidden in a corner that was rumored to be a place where children were sent to be punished, I wondered how many kids were even more afraid of the area because it was there. Considering we had just passed the big coal furnace that heated the whole school, I was not expecting a scary old wood burning stove to be there as I rounded the corner. The little room to the left is where kids were supposed to be locked in as a punishment. left over from the days when children graced the hallways and rooms. 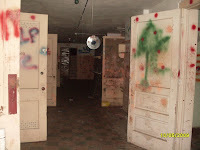 It has since been used for paint ball battles and haunted houses. 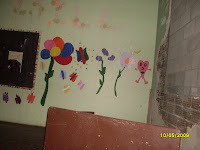 But once upon a time some children somewhere drew these paintings. Who would have thought they would end up still there in 2009, even with the school closed and deserted of children? 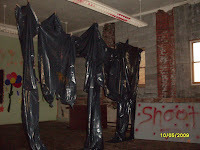 Down in the basement, the doors stand open, covered by paint ball blasts and echoing of long distant laughter. 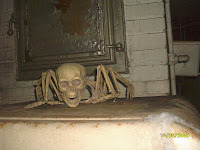 Despite my best efforts I felt like someone was following me down the dark hallways and into every room. Of course, this little attraction just added to the atmosphere. Loved it. 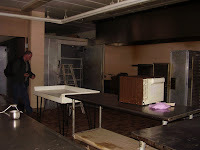 Strangely one of the more scary areas of the school was the kitchen. I can not imagine why. Cooks are usually friendly, right? All the ones I remember at Beaver Local were. Why then is this area so sinister? We are eager to explore the possibilities. And this room, once a classroom but now a bar area (who could have imagined! 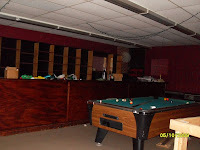 ), was odd because of this orb in the back ground. It is in several pictures, at different times of the day, taken by 5 different people. Yet there it is. Definitely more research is needed to determine this and many other aspects of this little school. I can't wait!! !